Venice, California now has a LEED Platinum building within its city limits thanks to the sustainable aptitude of Duvivier Architects and their design of the Brooks Residence. 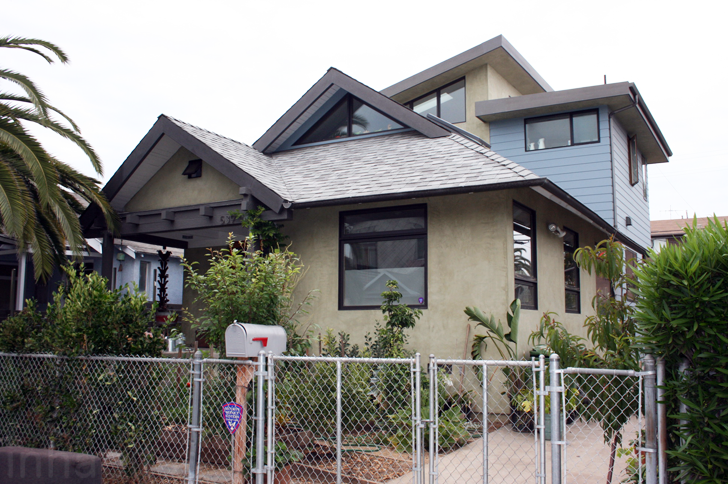 The home received a total of 109 points, ranking it within the top 10 LEED rated homes in California and the top 25 LEED rated homes in the US. Principal of Duvivier Architects, Isabelle Duvivier, is an ongoing advocate for low-tech, simple, and modern design implementations -- not to mention an environmentalist at heart. So unlike typical LEED Platinum buildings which are built completely new, the Brooks Residence is a remodel and addition to a 1912 Craftsman Cottage. That means in addition to the typical day lighting schemes, ventilation (there is no need for air conditioning), low-flow fixtures, and energy saving appliances, this home has a number of unique stories that begin to reveal themselves as soon as you step over the entry threshold. For starters, the 100 year old floor in the home was restored and the addition was matched to the original thanks to a neighbor’s old flooring which had been sitting unused in storage. The staircase and the open bookshelves are all up-cycled from the 2 x 4s of the existing cottage walls that were removed during the remodel. All materials used throughout the house utilize a high percentage of recycled content, including the exterior siding, bathroom tiles, concrete countertops, insulation, and foundations. At the completion of the project, 76% of the construction waste was diverted from the landfill. Other sustainable features extend into the home’s backyard, where a culvert and club house were built to prevent the need to remove any dirt dug-up from the site during the remodel and building of the addition. 91% of the plants on the site are native to reduce water consumption, and additional conversation efforts include a stormwater system of permeable surfaces and two rainwater cisterns prevent runoff from leaving the site. The entire front yard has been converted into a vegetable garden in order to encourage a local dialogue about organic produce, share food, and to build community. Best of all, the total cost of the 2,000 square feet remodel and addition was $450,000 (or roughly $225 per a square foot). The Brooks Residence is truly atypical when it comes to LEED Platinum buildings, but a shining example of how our current building stock can be upgraded at reasonably affordable prices. The staircase and the open bookshelves are all up-cycled from the 2 x 4s of the existing cottage walls that were removed during the remodel. All materials used throughout the house utilize a high percentage of recycled content including the exterior siding, bathroom tiles, concrete countertops, insulation, and foundations. At the completion of the project, 76% of the construction waste was diverted from the landfill. The cabinetry throughout the kitchen are Ikea cabinets that have been given an upgrade using reclaimed lumber. The cuts made on the face of the cabinet were cut in an organic manner, mimicking the natural lines of the reclaimed wood. Daylight was incorporated throughout all the rooms in the remodel, including the bathrooms. The 100 year old floor in the home was restored and the addition was matched to the original thanks to a neighbor’s old flooring which had been sitting unused in storage. Here is a view of the old interiors of the Brooks Residence prior to the remodel. It takes 6 old 2 x 4s to make each stair landing. Likewise, it takes 6 old 2 x 4s to create the width of each bookcase. The new loft is addition makes for a great children's bedroom. The daylight illuminates the dining area throughout the day. The dining room showcases the variety of different types of insulation available. From left to right: rigid foam (used in the attic), ultra touch, green gaurd, cellulose, ultra touch, rigid. Photo of the staircase, looking down from the loft. The entire second floor was home was apart of the addition. Careful care was taken in the selection of the materials for the flooring and its instillation. All decisions regarding the design of the home ensures its sustainability and efficient use of relatively inexpensive (but beautiful) materials. 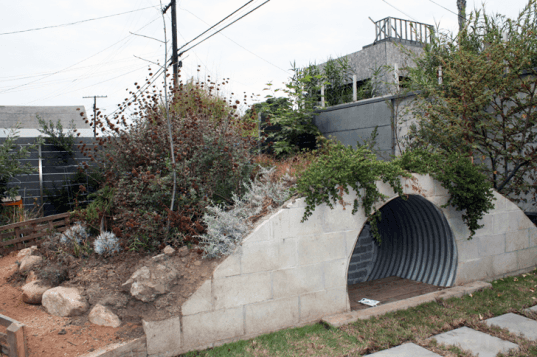 Other sustainable features extend into the home’s backyard, where a culvert and club house was built to prevent the need to remove any dirt from the site that was dug-up during the remodel and building of the addition. Here is the original backyard, prior to the addition and remodel. 91% of the plants on the site are native to reduce water consumption and additional conversation efforts include a storm water system that prevents runoff from leaving the site due to permeable surfaces and two rainwater cisterns. The dirt mound makes for an excellent clubhouse opportunity.